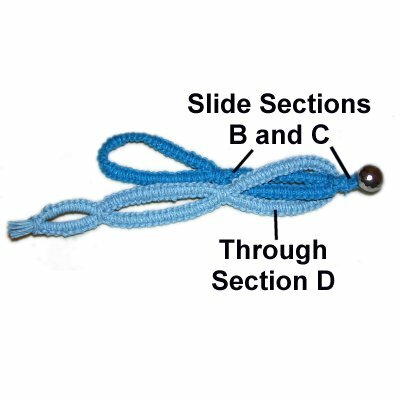 Description: The Link Bracelet features several sections made with the Square knot. 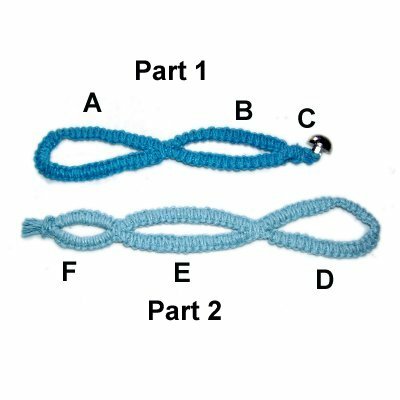 The clasp in one half is made with the Buttonhole Stitch. The most interesting thing about this bracelet design is that the two parts are linked in the center. 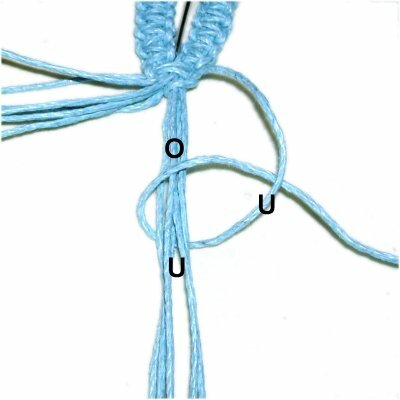 The technique is sometimes called an infinity knot. 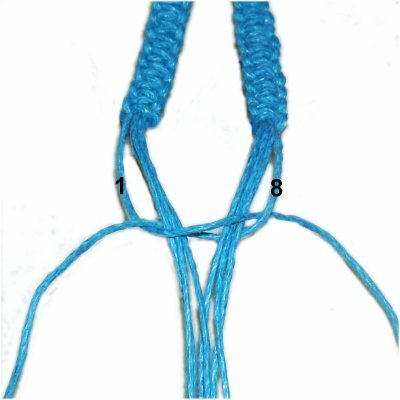 In the example shown, Hemp material was used so the knots were more distinct. 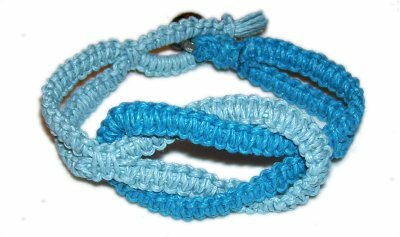 Cotton material will make the bracelet smoother and more flexible. 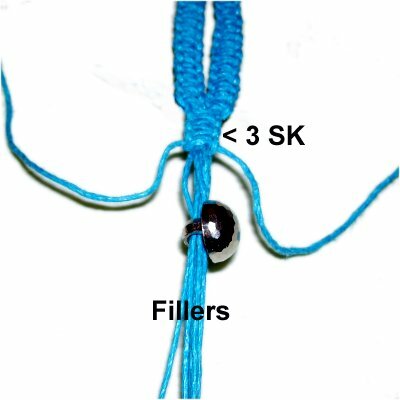 This Macrame project is easy, suitable for beginners. Cut 2 working cords, each 8 times the finished size you wish to make. Cut 4 cords, each 40 inches long (fillers). Cut 2 working cords, each 8.5 times the finished size. Prepare the tips of all the cords with glue or tape. Step 1: Secure one set of cords on your board vertically, with tape across the center. The 40-inch filler cords should be between the two working cords. Move the left working cord to the right, passing over the fillers and under the right working cord. 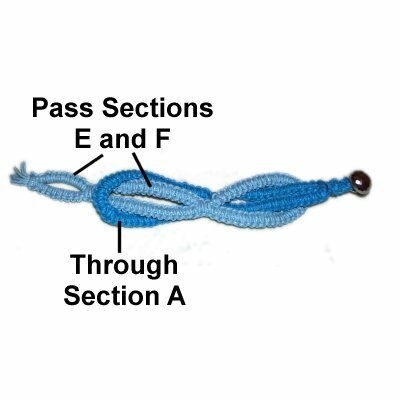 To complete the first half of the Square Knot, pass the right working cord under the fillers, heading left. As you pull it out on the left, pass over the left working cord. Pull both working cords firmly, and tighten the knot so it rests against the tape. The two working cords have switched places. Move the left working cord (now on the right) over the fillers and under the other working cord. 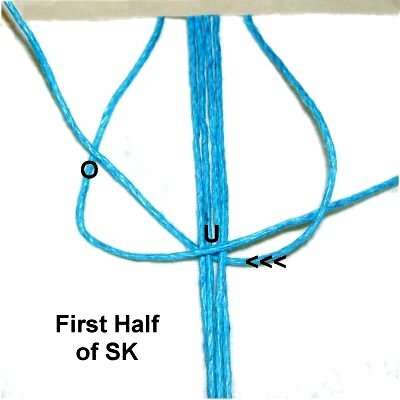 To make the second half of the SK, move the right working cord (now on the left) under the fillers. As you pull it out on the right, pass over the other working cord. Step 2: Tie a series of SK following the steps above, until the sennit is 2 inches long. Make sure they are all tightened firmly. Push the knots closer to each other as you progress. Step 3: Turn the sennit around and go back to the center. 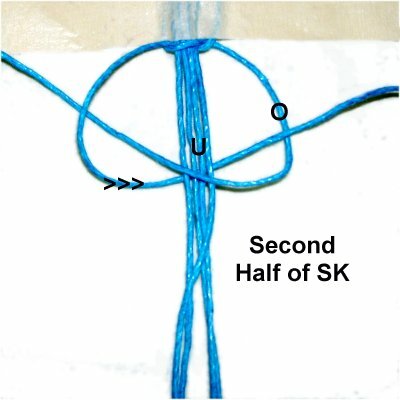 Begin by tying the SECOND HALF of the SK, which means you start with the working cord resting on the right. Then continue the sennit until it's 4 inches long. 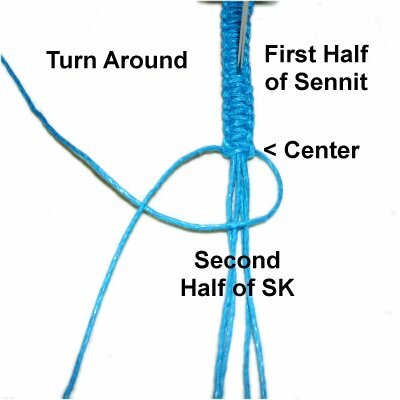 Fold the sennit at the center, matching the last SK at each end. Mentally number the cords. 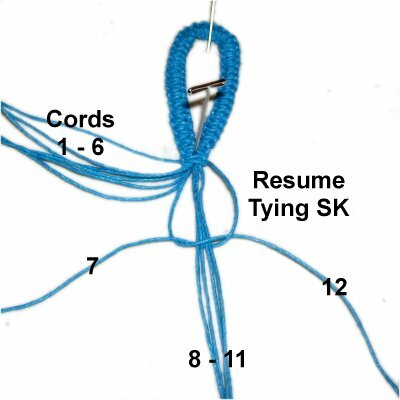 Use working cords 1 and 12 to tie a SK around all the other cords. Try to keep the cords arrange neatly, so they don't overlap. The SK will be large and wide. Tie a second SK below the first. Step 4: Subtract 2 inches from the finished size you are making, and tie a sennit of SK measuring that size. Do this with cords 7 - 12 (working cords 7 and 12). By the time you are finished, the working cords will be quite short. You don't need to do this if the remainder of the working cords is more than 8 inches. Design Tip: The image above shows the sennit lifted up and bent backward for the optional finish. Step 5: Mentally number the remaining cords (if you tied off in the previous step). Move the working cords aside. Slide the button onto the FILLERS. Tie a tight SK below the button using the working cords. Apply glue while tightening. Step 5, continued: Turn over the Link Bracelet. 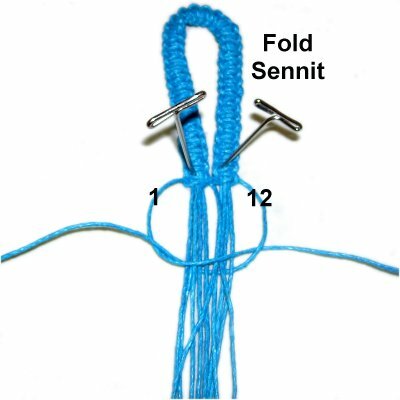 Bend the fillers backward, towards the Square Knots. 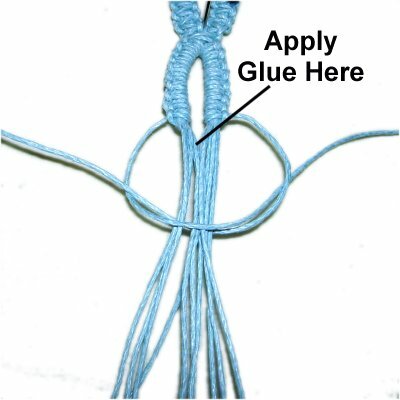 Tie a Barrel Knot with the working cords, so it rests on top of the fillers. Tighten it as much as you can and apply glue. Apply glue under the fillers, adhering them to the back of the three Square knots. 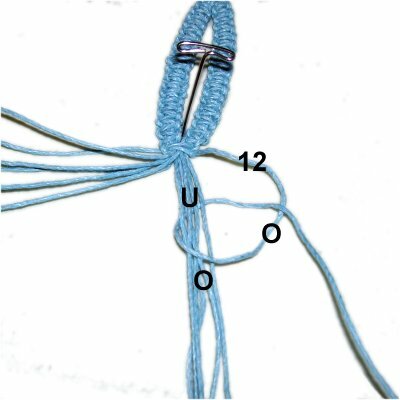 Use the other set of cords to make the second half of the Link Bracelet. Step 6: Repeat steps 3 and 4. DO NOT tie off the working cords, even if you did so in the first half. Mentally number the cords. 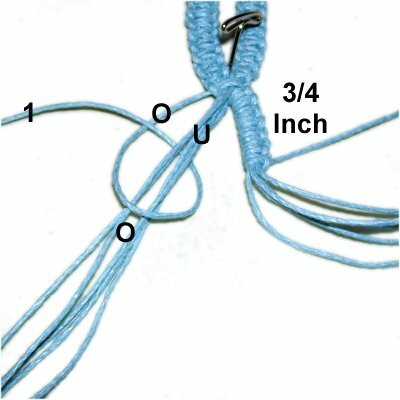 Use cords 1 and 12 to tie one Square Knot around all the others. Divide the cords into two sets of 6. 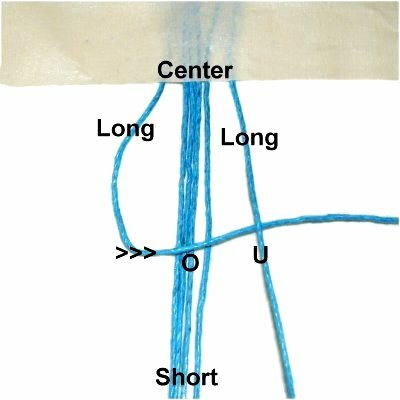 Make a clockwise loop, passing over - under the other cords (7 - 11). As you pull it right, pass over cord 12. 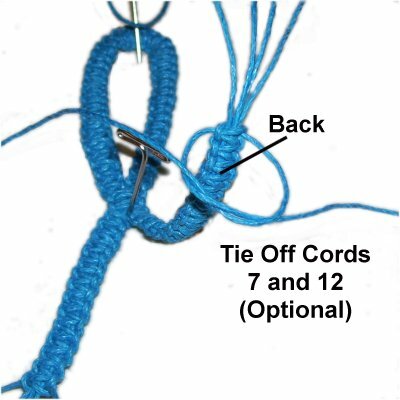 Make another loop, passing cord 12 under - over the other cords. As you pull it right, pass under cord 12. 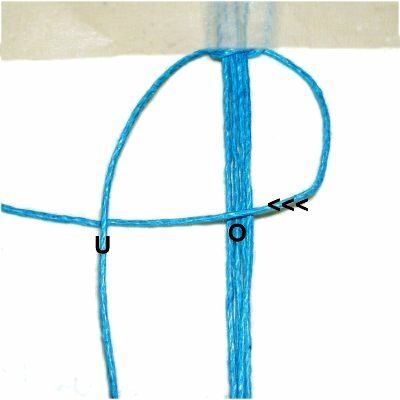 Both loops = one Vertical Larks Head knot. Tie several more knots, until the clasp is 3/4-inch in size. Repeat the same process on the left, using cord 1. The loops are made counter-clockwise. 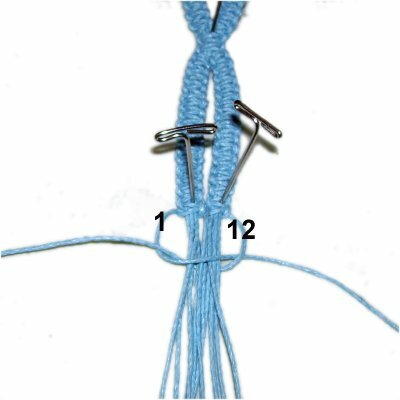 Complete the clasp by tying a tight Square Knot with cords 1 and 12, around all the others. Apply glue as you tighten, in the area just below the Larks Head knots. Step 8: Bend the clasp backward, or turn over the Link Bracelet. 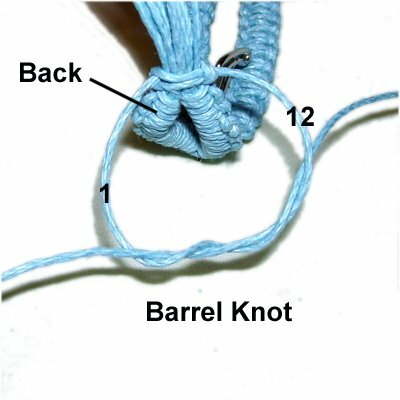 Tie a Barrel Knot with cords 1 and 12. Make sure it rests in the back of the SK tied in the previous step. Apply glue as you tighten. When the glue is dry cut off the excess material (cords 1 and 12). Step 8, continued: Trim the remaining cords to 1/2-inch, and apply glue to the tips to prevent unraveling. The Link Bracelet is finished. 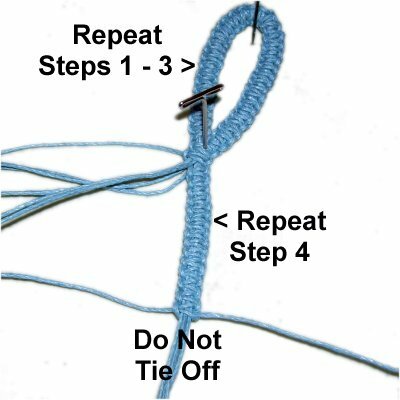 The following steps show you how to connect the two parts. Place the two designs on your work surface, so that Part 1 (with the button) is above Part 2 (with the buttonhole clasp). They should be heading in opposite directions. Mentally label the sections as shown. Sections B and C (from part 1) go through section D (from part 2). Make sure you pass into section D from back to front, as shown. Sections E and F (from part 2) go through section A (from part 1). Make sure you pass into section A from front to back. Pull the two halves gently in opposite directions, so the Link Bracelet looks like the image below. Have any comments about the Link Bracelet? Contact Me.